We live in a world of electronics that all need electrical power to operate. Power converters or adapters are ubiquitous and come in all shapes and sizes. Some are external (e.g. laptop), whereas others are neatly tucked away inside the system (e.g. TV). Power electronics employs solid-state devices to process or convert electrical power—input power is processed with some control to produce conditioned output power. Most converters today are Switch Mode Power Supplies or SMPS. Figure 1 shows a block diagram of SMPS based ac-to-dc converter. They turn input power at a given voltage and current to output power at a different voltage and current. This transformation is done by storing input energy in components called capacitors and inductors, then chopping that energy up into packets using a semiconductor switch, and then changing these packets of energy to a different voltage and current using a transformer. Capacitors, inductors and transformers are considered passive components. In SMPS, these components are physically large. The semiconductor switch that performs the energy chopping function is the key element in this system. It sees high current flow and power losses that manifest as heat. Heat generated from the conversion losses, along with the inductors and capacitors, dictates the size of SMPS and makes them physically large. Block diagram of SMPS based AC-to-DC power converter. 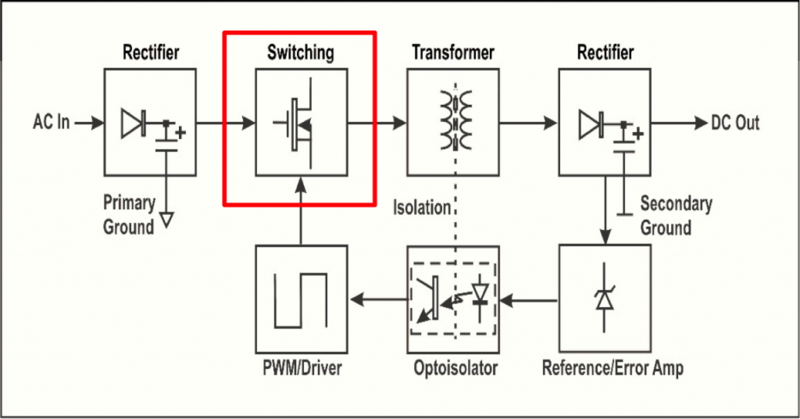 Semiconductor switch is the key element in this system. To reduce the size of SMPS, we have to operate at high frequencies. Passive components such as inductors and capacitors make up the bulk of power system volume. Operating at high frequencies allows the reduction in their size. However, in order to operate at high frequency, we need a better switch – one that can run at MHz (106 or million Hz) frequencies. For the last three decades, silicon-based power devices (MOSFETs, IGBTs, and diodes) have dominated the power device market. Although there have been tremendous improvements in silicon power device performance, they are now approaching the physical limits of silicon. Silicon-based switches can only operate in the kHz (103 or thousand Hz) range. Additionally, material properties of GaN allow it to operate at higher voltage and lower currents to further lower conversion losses. Baliga Figure of Merit (BFOM) is a unified figure of merit that takes into account maximum voltage and resistance of the power semiconductor switch. BFOM of GaN is over 1000x better than Si and nearly 3x better than SiC. NexGen Power Systems’s resonant circuit topologies and control circuits are designed to achieve lossless switching by fully exploiting the benefits of True GaN™ technology. The True GaN™ platform makes it possible to build the smallest, lightest and most efficient power systems on the planet. This platform will also be extended to design modules for other stages of power conversion.